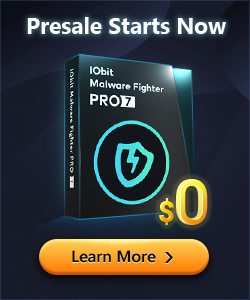 Why IObit Malware Fighter PRO? IObit Malware Fighter PRO is an enhanced edition of free. Its advanced features will ensure you a much safer PC and online surfing. Detect & avoid ransomware attacks proactively, disable infected ransomware from encrypting your files. Integrated PC protection in real time including USB disk and camera safety guard, malicious action Monitor etc. World-leading Bitdefender anti-virus engine provides unbeatable malware & virus detection and removal. "The program uses two AV engines, its own and BitDefender, and seems to be effective against malware that cannot be detected by other similartools so it is good that it can run together with your standard AV software. It can detect a wide array of spyware, ransomware, adware, Trojans, worms, keyloggers and bots." "We used to use up to a dozen different programs to keep our machines running smoothly and keep the bad guys out. It took hours every week to maintain security and performance. Now, with IObit Malware Fighter Pro and Advanced System Care Pro, everything is in one place and it takes us just a few minutes every couple of days to do the same jobs with much more confidence. We have not had a problem since using your products." "Some years ago somebody drew my attention to IObit Malware Fighter. First I was sceptic. But after installing it, it became my favourite anti-malware program. It is very easy to use. Through the years it already has detected several threats and removed it. In cooperation with the other IObit programs, like for example ASC, I have a good PC protection. I now recommend these programs to all my friends and family." "I am very satisfied with your product IObit Maleware Fighter. Previously this product came to me I had a lot of troubles with malicious interferences, I was not able to watch an entire movie or concert, which I like very much. Due to your product now every operation is clear, safe and well protected. It scans my laptop without affecting its performance while I also recommended this product to two of my friends." "I would like to say a great thanks to all the staff at IObit for working hard to bring us the best programs out. It is great update you have made for your users. It is lot quicker at scanner and easy to use. People who really want a good Malware and ant-virus program which is also good value for money need to look no further than IObit Malware Fighter. I would recommend that they forget the rest and get the best which is IObit Malware Fighter."